Why Choose City for Heating and Air Charlotte? (704) 400-0000 | We never close! Home » Why Choose City for Heating and Air Charlotte? 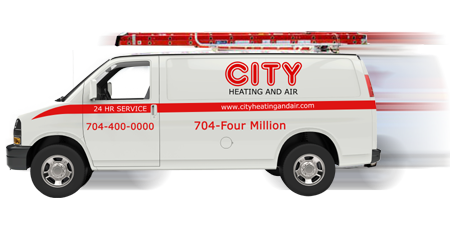 City Heating & Air has been thriving in the HVAC installation, repair and maintenance business for more than 15 years. A decade and half of heating and air Charlotte servicing along with ongoing technical training and rigorous interpersonal skills training. This has ensured that we don’t just constantly provide good service; we also keep getting better as we learn from our own experiences. On-time delivery – all the time. We know just how important it is to feel safe and comfortable at all times in your own home. That’s why we at City Heating & Air provide 24-hour emergency services, 7 days a week. On top of that, we are also proud to announce that we offer a same-day service option for people who need things done right away. Some companies give ridiculously low quotes at the beginning and yet shock customers when they give astronomical bills upon completion of work. Not at City Heating & Air. We give a flat rate for our heating and air Charlotte services and our honest assessment of just how much you’ll spend before the project begins. Entrusting your home’s HVAC is a huge decision that will dictate your home’s safety and comfort. You should entrust your home to a company that values life, security and comfort just as much as you do. All installations that City Heating & Air perform are to code by qualified installers with all the necessary permits. Our technicians use state-of-the-art equipment and the best materials. We apply the latest techniques and technology for your home energy requirements to guarantee the appropriate size and design of your indoor HVAC system. Our Technicians are thoroughly trained in all areas of heating and air conditioning services and repairs. They will be at your house on time and will treat you and your house with respect while they are there. We ensure our Technicians are equipped to handle each call-out with everything they need to succeed. City Heating & Air only employs the best of the best, our Technicians are not only highly trained and experienced, but are also background screened and drug tested for your peace of mind. Each encounter you have with City Heating & Air from the initial contact to completion of our Technician’s visit, will be exceptional. We will exceed your expectations, guaranteed. City Heating and Air is awesome! They were very easy to get a same day appointment. Adam showed up promptly at the appointment time and our AC was back up and running very quickly. Super honest, very reliable and affordable. We give them 5 stars!! !